WEBB's single acting or double acting seam welders produce longitudinal seams and are offered in a variety of sizes and capacities. Our welding equipment line assists you in positioning, assembling and automatic production. Weld longitudinal seams with our SINGLE ACTING or DOUBLE ACTING SEAM WELDERS. 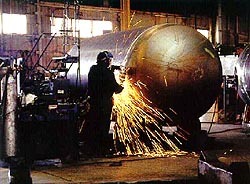 We offer models designed to handle all types of cylindrical and flat work. The double-acting machines permit welding without prior tack welding. Whether you are joining small parts or large, Webb brings you a variety of sizes with standard and optional features. 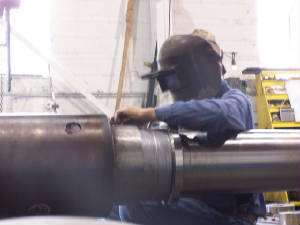 Webb combination ASSEMBLY and GIRTH WELDING MACHINES combine to create what some call "welding lathes". By assembling and rotating the workpiece, tack welding is eliminated and production welding becomes a simple operation. FIXED BASE and PORTABLE TURNING ROLLS Webb's medium duty turning rolls are designed so that any of the power units in the three different sizes can be easily interchanged with any of our idlers. Each machine in our extensive line offers features to help your production process. Purchase machines that can grow and change with your fabricating requirements. 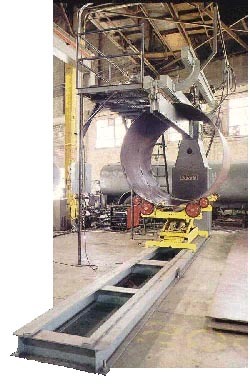 Other Webb components include TRACK SUPPORTS for both medium and large tanks, WELDING POSITIONERS, BALL DOLLIES and other products specifically manufactured to do the job-at-hand. Most are built of all-steel construction but some use alloys designed for the task or even copper components (to prevent magnetic disturbance of the arc during welding). Webb's SINGLE ACTING or DOUBLE ACTING SEAM WELDERS produce longitudinal seams and are offered in a variety of sizes and capacities. OFFSETTER MACHINES produce a tapered off-set joint for easy mating of tank heads and shells. 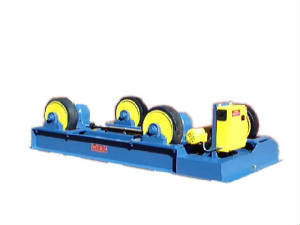 FIXED BASE and PORTABLE TURNING ROLLS make heavy tank and vessel rotation an easy task. A Webb ASSEMBLY PRESS is an economical way to hydraulically join pieces with up to 25 tons of pressure for easy girth welding. ASSEMBLY and GIRTH WELDING MACHINES are combination units designed for production welding. Other Webb components include TRACK SUPPORTS for both medium and large tanks, WELDING POSITIONERS, BALL DOLLIES and other products specifically manufactured to improve your plant. Whichever model you choose, Webb designers have engineered it for safety, proper work height and ease of use. Technical issues have also been addressed. Even the raw materials used to build Webb products have been carefully chosen. From all-steel construction (for strength) to copper components (preventing magnetic disturbance of the arc during welding), each part of a Webb machine has been designed for a long, productive life.